that is as spellbinding as it is thrilling. Wild West shootouts, lost gold, retribution, myths, maps, romance and betrayal… find it all in spades in Erin Bowman’s brilliant Western adventure, Vengeance Road. I loved everything about this book. From it’s western dialect to our valiant heroine, from the rich character interactions to the way that danger relentlessly clung to them. Everything wonderfully came together in a way that made it seem as if I were on an adventure, right along with Kate. I could imagine the dusty Arizona roads in 1877, feel the stifling heat, understand the hope and promise of finding a means to live a life without struggle. But for eighteen-year-old Kate Thompson, what drove her journey across the perilous Arizona frontier, was vengeance. When Kate finds her father brutally murdered by the notorious Rose Riders, she swears she’ll find and kill the men behind it. As her home burns into embers, she saddles up and rides out, rifle ready to claim revenge. Disguised as a boy, she clues together bits of information to find Waylan Rose and his band of mercenaries. The more truths she unearths, the more she realizes that the lies, the secrets, the deaths she experiences along the way, all stem from man’s greed for gold. She finds herself soon accompanied by the Colton’s—Jesse, and his brother, Will. Together, and each for different reasons, they ride hard while dodging bullets. Kate didn’t care if she made it out alive. Their trek is anything but peaceful, as both Kate and Jesse sling insults at each other, when they’re not riding for their lives, that is. Both Kate and Jesse are filled with anger, scarring visions from their past keeping their blood at a constant boil. Soon enough, however, as their lives precariously hang in the balance, they begin to understand each other, openly and truthfully. But would intensifying feelings be moot when their adventure is cut short? Could actions taken with the best of intentions permanently sever their fragile bond? Was their quest doomed from the very beginning? 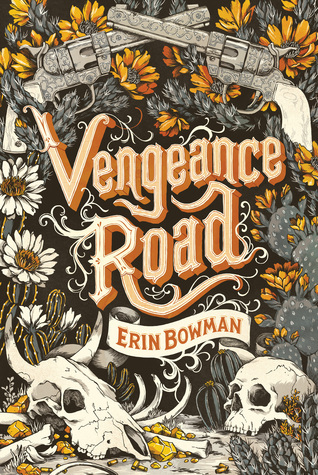 Vengeance Road brims with grit, honesty and intrigue. Bowman skillfully enlivens a sand-dusted world of danger in a way that makes it impossible to put down. I was just as mesmerized by the rich character interactions as I was with this gripping storyline disrupted by many a shocking surprise. This is definitely one of my favorite novels this year and one you shouldn’t miss. Great review! Can’t wait to read this, love the cover!